In Los Angeles County, a 2014 TIGER grant is going toward improvements on a 2-mile stretch of highway where the congested 57/60 freeways converge. If you drive in the County, you probably know the 57/60 Confluence all too well…and for all of the wrong reasons. The 57/60 Confluence is a vital route for the movement of goods from the Southern California ports. The 60 Freeway carries trucks from the ports of Los Angeles and Long Beach to warehouses in eastern Los Angeles and Riverside counties, as well as the entire United States. The 57/60 Confluence Project is named after the stretch of roadway where the 57 and 60 freeways become one and 17 lanes of traffic merge sharply into only 14, resulting in frequent traffic delays and accidents. More than 356,000 trucks and cars use that segment each day, and drivers approaching the bottleneck attempt to weave across multiple lanes. Last year’s TIGER grant is going toward the $260 million total cost of the project, expected in three phases, and earlier this month the cities of Diamond Bar and Industry kicked off the construction of phases one and two. 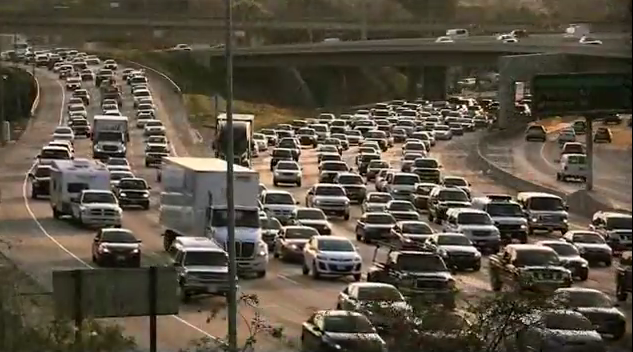 This critical section of highway —with its intertwined freeways, dangerous lane configurations and heavy truck traffic— was ranked Number 1 for delays and truck accidents in California and Number 8 in the Nation by the American Transportation Research Institute. Caltrans ranked it among the top five most congested freeway interchanges in Los Angeles and Ventura counties. The project includes ramp and interchange reconfigurations and the addition of mainline and bypass lanes to reduce weaving. The $10 million TIGER grant will be used specifically for construction of a westbound freeway off-ramp at Grand Avenue in the project’s second phase. But, while phases one and two are moving forward, funding for the third and largest phase of the 57/60 Confluence Project has yet to be identified. Considered the bulk of the project —with the mainline improvements and bypass roads on the 57 and 60 freeways to eliminate the weaving— it currently has secured zero funding and is an unfortunate reminder of the great need for funding throughout the country where projects are not moving forward. Just last month the Department awarded TIGER grants in the seventh round of the program, funding 39 projects in 33 states for a total amount of nearly $500 million. But we actually received 627 eligible applications requesting more than $10 billion in funds. The TIGER grants we were able to award represented less than 5 percent of the total amount requested for these deserving projects across the nation. The overwhelming number of applications received by the Department underscores the need for additional transportation funding and for a long-term transportation bill that allows all 50 States to make projects such as this one a reality.